Quaker Green in West Hartford, Connecticut is a tranquil, park-like community. Its classic architecture and lush landscaping can be seen throughout the development. At the heart of the community is the well-appointed clubhouse that supports an active lifestyle with social and recreational amenities. Development of Quaker Green began in 2006 and currently has plans for 148 residences. These homes offer upscale living that can appeal to many discerning homebuyers. At the community entrance, fieldstone walls and ornamental light fixtures welcome residents and visitors in style. The enclave's charming streetscapes feature classic design with Belgian block curbs and winding sidewalks. Quaker Green offers a fabulous location within easy access to many shops, restaurants and nearby attractions. Close proximity to Routes 84 and 91 make it easy to travel or explore the surrounding areas. 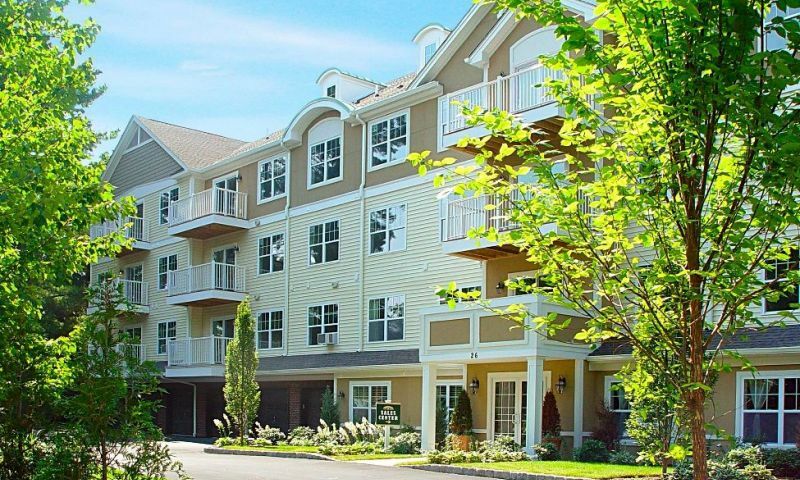 Residents at Quaker Green also enjoy the benefits of living adjacent to Beachland Park, which offers walking trails, ball fields, open natural spaces, and a scenic pond. The well-appointed clubhouse at Quaker Green supports an active lifestyle with several social and recreational activities. Residents can gather in the beautifully appointed clubhouse that offers a multi-purpose social room, game room, and a convenient business center. Residents can enjoy a friendly game of cards or stay in shape with a visit to the fitness center. Outdoors, homeowners can enjoy a sunny day at the outdoor heated pool. A spacious sundeck makes it easy to soak up the summer sun and visit with friendly neighbors, while the fenced and gated playground is a perfect spot to take visitors. There is also a BBQ grill available for residents to enjoy. Sidewalks and trails which lead through the adjacent Beachland Park also make Quaker Green a very walkable community. Homes at Quaker Green are designed to make an efficient use of space, and are ideal for homebuyers who want low-maintenance living. The thoughtfully designed homes in Quaker Green are built to offer upscale style at an affordable price. Condos are available in multiple floor plans as single-level living options in a four-story building, Parkside North and Parkside South. Units range in size from 648 to 1,099 square feet. Each unit has one or two bedrooms, and one or two bathrooms. Some floor plans offer a den or balcony as well. Condos have garage parking on the lower level for one or two cars. Units in the Parkside North building are available on a resale-only basis, while new construction units are available in Parkside South. In addition to its condos, Quaker Green also has two-story townhomes, which have three bedrooms, two-and-a-half bathrooms and attached one-car garages. The Ives model offers 1,702 square feet of living space and is available on a resale-only basis. Quaker Green s tranquil setting and small number of homes offers a charming community where neighbors can easily become friends. The park-like grounds and neighboring Beachland Park are ideal for picnics, long walks or simply sitting and enjoying the outdoors. Residents may socialize in the clubhouse or explore the neighborhood's surrounding area. Quaker Green s prime location in West Hartford further enhances its popularity among a variety of homebuyers. Easy access to the adjacent Beachland Park and nearby retail centers make for a highly sought after community. Residents are within walking distance to a grocery store, hardware store, and dry cleaner as well as various shops and restaurants. A short drive brings residents to all the attractions at West Hartford Center and Blue Black Square. Close proximity to Routes 84 and 91 puts Quaker Green within easy access of the surrounding towns. The community is just 10 minutes from Downtown Hartford, and 15 minutes from New Britain. It is also within an hour-long drive of hot spots along the Long Island Sound, like Bridgeport and West Haven, and about two hours from New York City. This charming community with a great clubhouse and plenty of nearby attractions is sure to please the active lifestyle of any prospective homebuyer at Quaker Green in West Hartford, CT. There are plenty of activities available in Quaker Green. Here is a sample of some of the clubs, activities and classes offered here. Condos at Quaker Green offer single-level living options in a four-story building with one to three bedrooms, one or two bathrooms, and one or two-car garage parking. Quaker Green townhomes offer an elegant design, gorgeous floor plans and private backyards. All homes have over-sized two-car garages. Townhomes offer 1,702 square feet of living space with three bedrooms, and two-and-a-half bathrooms. These homes are available on a resale-only basis. Condo living is fabulous! I was a little hesitant to make the move from our old traditional home but now that we've lived here awhile we just love it. No more mowing the lawn or shoveling snow for us! It's amazing more much of a time saver it is not having to do those mundane tasks. We love our condo too, it's light, bright and open. The amenities here are very nice and the location is perfect. Highly recommended! 55places.com is not affiliated with the developer(s) or homeowners association of Quaker Green. The information you submit is distributed to a 55places.com Partner Agent, who is a licensed real estate agent. The information regarding Quaker Green has not been verified or approved by the developer or homeowners association. Please verify all information prior to purchasing. 55places.com is not responsible for any errors regarding the information displayed on this website.